During our planning, I researched the hell out of stock, ready-to-assemble, and custom cabinets. We ultimately decided to go with IKEA cabinets because they’re cheap, pretty easy to install, surprisingly durable, and look great. Then last year, we ended up remodeling the kitchen in our downstairs apartment. It’s almost the exact same layout, so we figured we’d take roughly the same approach that worked so well for us a couple years earlier (and has worked out great since). And as if that wasn’t enough, they were out of butcher block counters, too. Another two-week wait. We needed to get all this done while I had a break between jobs, so we didn’t have much flexibility in terms of timing. So we had to scrap our plans for IKEA Kitchen 2.0, and start shopping the big-box home improvement stores. That means I’ve bought and installed both IKEA cabinets and Home Depot’s stock Hampton Bay cabinets (not to mention IKEA butcher block vs. Lumber Liquidators), so I can give you a pretty good pros-and-cons review of each from a DIY perspective — at least from my personal experience with them. 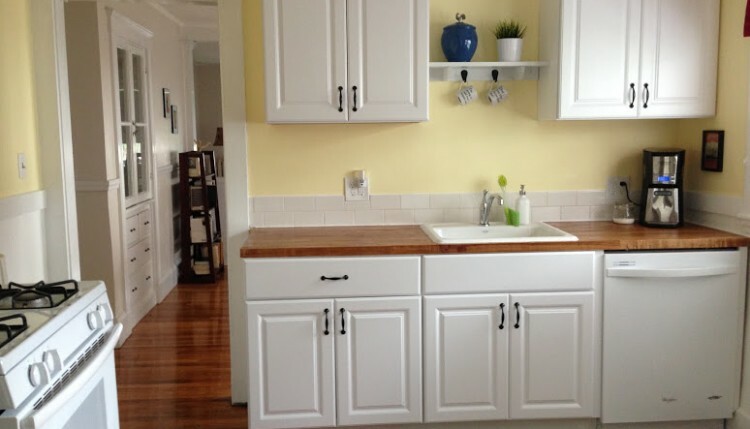 Which cabinets were easier to install, better quality, and just look nicer? Well, that’s easy: The IKEA cabinets beat Home Depot’s stock cabinets hands down in just about every category — except availability at the time. In terms of overall cost, IKEA’s cabinets and Home Depot’s stock Hampton Bay line were roughly the same. We got a higher-end trim of the IKEA cabinets, so they could potentially be cheaper — but we got a small kitchen’s worth for about $1,600 total. I convinced myself that the pre-assembled Home Depot cabinets would save me time and hassle compared to the IKEA ones — after all, it takes a solid half hour to assemble each IKEA cabinet, and that’s after you’ve done a couple of them and gotten the hang of it. The assembled cabinets are BIG. I went to pick them up at Home Depot, and even with a completely empty hatchback with the back seat folded down, I could only get two cabinets in the car at once. I had to make multiple trips just to get them all home. The assembled Home Depot cabinets are bulky, heavy, and awkward. Getting them from the car into the kitchen by myself was brutal, too. They’re pretty heavy, and the weight isn’t distributed evenly. Plus, the base cabinets are about 30″ x 24″ and our old doorways are all 30″ — it was a tight fit. You actually have to disassemble them somewhat to install them. While the Home Depot cabinets were all assembled in the box and ready to go, you have to take off all the doors to actually install them (unscrewing them in several spots) — and then screw them back on afterward. It took almost as much more time as assembling an IKEA cabinet from scratch. We got all of our IKEA kitchen stuff delivered for a flat rate of $99 (I believe this varies by how far you are from a store). But it’s easy to pick up an entire kitchen’s worth of cabinets from the store — they of course come in IKEA’s famous flat-pack boxes, so it’s easy enough to get them home. If you go with IKEA cabinets (or most other ready-to-assemble stock cabinets), expect to take up to an hour or so assembling your first cabinet, and then you should be able to whip through the rest of them in 15-30 minutes each as you get the hang of it. I never thought I’d say this, but the cabinets we got from IKEA are pretty diesel. We’ve had them for four years now (most of that time with a small child around), cook at home almost every day, and still they’ve endured the abuse of modern family life admirably. The “enamel” as I call it is wearing off in just one spot, under the trash can, which rubs against it every time I yank it out and push it back in with a handful of onion peels or whatever. But for the most part, I’ve been extremely impressed, and they look and feel nicer as well. The particle-board base of this Home Depot cabinet was falling apart by the time I got it home. Want to know why it came apart so easily? IT WAS STAPLED TOGETHER. So, there you go. Staples: Good for term papers, bad for kitchen cabinet joinery. They also have a kind of cheap-looking finish to them compared to the white IKEA cabinets. On the whole, I wasn’t impressed. Moisture bubbles have formed in the Home Depot drawers. This goes to IKEA hands down. For starters, they’ve designed them so you can get a suspension rail that you secure to the wall (to the studs). Then the wall cabinets simply hang on that rail. You know how much easier it is to keep a strip of aluminum perfectly level while you screw it in than, say, a boxy, 40-pound cabinet? MUCH easier. Also, IKEA’s cabinets come with adjustable, self-leveling legs, so you don’t have to deal with tapping in a dozen shims just so in several different places trying the get the whole row lined up evenly. I didn’t realize what a lifesaver those legs were — particularly in a wavy house like our old lady — until I was on my 10th shim with the Hampton Bay cabinets. And finally, the IKEA cabinets came with strips across the top of them that you can mount a countertop to. With most other cabinets, you’re kind of on your own in that department. Our IKEA cabinets have the soft self-closing feature on the drawers and cabinet doors. So you (or more typically your three-year-old) can’t slam them shut — they catch and then slowly pull all the way in. It’s an AMAZING feature I can’t imagine living without at this point. And you know how much that little luxury costs when you go with IKEA cabinets? Like four bucks a cabinet. It’s just a little air-cushion mechanism that you snap into place on the hinges. Ingenious. Meanwhile, to get the same feature on other cabinets it’ll cost literally 10 times that or more. Using IKEA cabinets means it’s easy to incorporate other cool stuff of theirs, too, like their clever storage designs and pull-out shelves. At the time, this was one limitation of both IKEA and Home Depot’s in-stock cabinets — they only came in some fairly common sizes. IKEA did have a few more options, with multiple sink base sizes and drawers and cabinets at 12″, 15″, 18″, 21″, 24″, 30″ and 36″. The stock Hampton Bay cabinets had very few available sizes, and no irregular sizes like 21″ for instance. And that’s huge, because everyone’s kitchen is different. Unless you live in one of those awful McMansion developments — God help you. And everyone uses their kitchen differently. Some people want lots of drawers, others want open shelves to see where everything is and show off some cute stuff. The new system actually allows you to install nesting drawers — a big drawer face with a smaller drawer inside it. Outrageously cool. So, if our house were a three-decker — thank God it’s not! 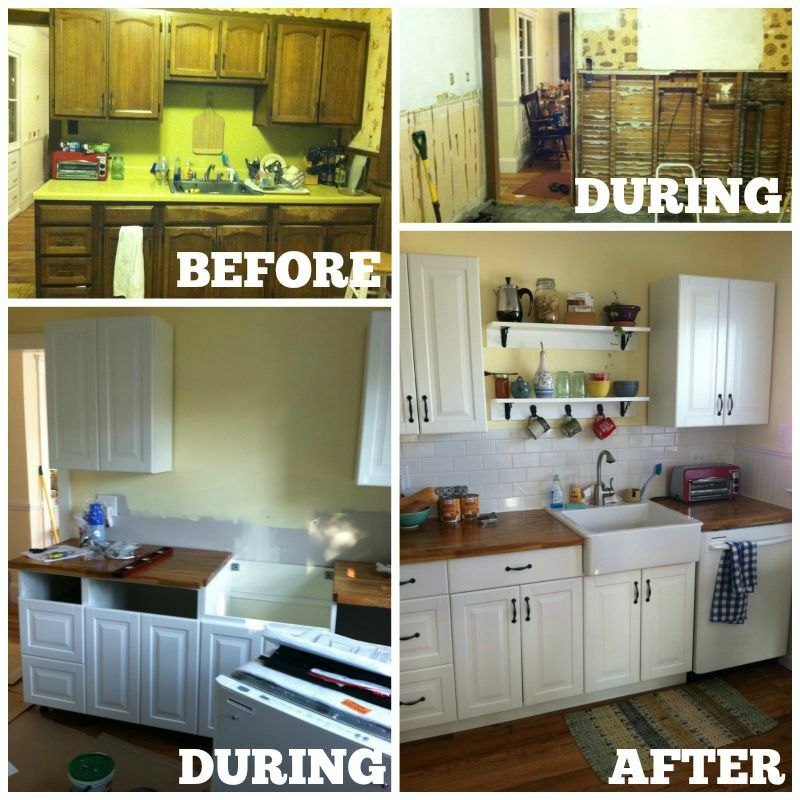 — and I had yet another dumpy old kitchen to makeover for under $4,000, which cabinets would I choose: IKEA or Home Depot? IKEA cabinets all the way. If you’re in a pinch again, the “unfinished” cabinets at Home Cheapo are decent quality and made of actual wood, not MDF. A little sanding and a coat of high quality primer and paint and you’ve got a great looking cabinet at a fair price. We used these for a pantry rebuild and a large island install (sink, dishwasher, and cabinets) and it worked well. Wow, it is amazing that you can buy new cabinets for a kitchen for about $1,600. I think it sounds easier to get the the flat pack kits so you can assemble them yourself. It would be hard to take home a fully assembled cabinet in my small car. Thanks for sharing your remodelling experience! Yeah our kitchen is only about 11′ x 11′ with a back door and small pantry one one side, so there’s not a ton of room for lots of cabinetry. Even so, an average 10 linear feet of wall and base cabinets with a drawer base or two will only cost you around $2,000-$4,000 at IKEA. You can find pretty good prices on stock ready-to-assemble cabinets online, too (e.g. rtacabinetstore.com and others). If you go for standard sizes like 15″ or 30″ you can get them with solid plywood boxes (vs. MDF), nice maple or other hardwood, and even dovetailed drawers without paying much more than IKEA prices. They’ll require assembly, which probably won’t be as intuitive as IKEA’s designs, but it’s the same basic concept. Good luck! so we bought a house 15 years ago that had Home Depot Mills Pride cabinets and they have been great!! However they don’t carry Mills Pride any more…just Hampton Bay and the white is just a tad brighter than the Mills Pride. Do you think I could paint the doors of all the kitchen cabinets to freshen up everything? Its not a big kitchen and I just want to “update” the color just a little. Thoughts?? Margot, of course! It’s a great way to rejuvenate a kitchen if the cabinets are still in good shape structurally and you like their shape and style, etc. This Old House has a great step-by-step guide to this: http://www.thisoldhouse.com/toh/how-to/intro/0,,20209705,00.html …Key points being remove the doors and make sure you clean everything really well with a degreasing agent since kitchens get coated in oil splatter from the stove. Then sand the wood, prime it with high-quality primer, and finish with 100% acrylic paint for a smooth coat, or even a spray paint if you can take everything outdoors. Update the cabinet hardware while you’re at it for like $25 and you’ve got a substantially updated kitchen! We struggled with options two years ago for a basement bar – really a wall full of lower and upper cabinets with a bar sink and mini-fridge, it’s like 3/4 of a kitchen. We selected the Hampton Bay cabinets from Home Depot, had a great delivery experience (for $99 I think? ), and have been very impressed with how they have held up. We have two young kids and, as a family, spend a ton of time in the basement, so the cabinets have seen wear. There was even a very minor leak under the sink for several weeks after we installed them. The leak went unnoticed for a few days and I have not had any issue whatsoever with the finish – the water had beaded on top of the finish and I just used a towel to dry it off. It seems to me like anyone with a clear understanding of what they are buying at this price range would be happy with either brand of cabinet. Been using some chinese RTA cabinets that assemble with dovetail glue joints. They look very nice inside and out. Been buying them two places. http://www.lilyanncabinets.com and http://www.walcraftcabinetry.com they are worth checking out. We have just put in a new kitchen into a totally rebuilt house. The kitchen was U shaped with N island . We love the extra features in the Ikea kitchen. They also have great drawer systems for dishes, kitchen stuff, etc. Anyway, Ikea was great except for the above the refrigerator cabinet and microwave/fan above the stove. We had to custom rebuild both from 15 inches to 12 inches so the appliances fit. What paint color you used for the wall ? Hi Jor, I believe it was Moonlight Yellow by Benjamin Moore. This is really helpful, thanks for posting. Can you speak to the difference between buying butcher block at IKEA and Lumber Liquidators. Hi Nicole, thanks, that’s a good question! They were both pretty good quality, and IKEA was a little bit cheaper. Although IKEA’s butcher block (at least at the time) had only one side you could use, which was a little limiting — the “bad” side was literally a splotchy mess and said “This Side Down” or something to that effect. With LL, I was free to choose the side I liked the look of best. However, LL only sold theirs in an 8-foot length, which was more than I needed, almost too big to get into my hatchback, and damn near killed me when I tried to wrestle it out of the car and into the garage. IKEA sells a few different sizes, so I actually bought two different pieces, one for each side of the sink, both of which I was able to lift pretty easily myself. When it comes to DIY, there’s something to be said for not getting a hernia! Thank you for taking the time to prepare and post this review; it’s incredibly helpful and has certainly made the conversation in my head over the last couple of years calm down. Thanks so much! We just finished (September 2016) a total kitchen remodel with Ikea Sektion cabinets. There were twenty two cabinets in all which I assembled out in the garage prior to the contractor doing the demo and installation. Below are my observations. 1. Ikea’s VERY buggy design software. I estimate I wasted at least 50 hours dealing with buggy software issues. This is a major deterrent to buying their product, and Ikea really should get these issues fixed. 2. Ikea store layout is very bad – you are forced to walk a mile to get to the cash registers. This is very frustrating to be forced to walk past every item in the store when all you want is one specific item. 3. Ikea needs to improve the pictorials for the hinge adjustments. There are in fact three screws that control the adjustment and the pictorials don’t clearly show you each screw. 4.. There is a great variability in product knowledge by Ikea employees. Sometimes you have to ignore information given by one employee and ask another employee the same question. In one case, I got dead wrong information from the Ikea help line and would have cut the side panels the wrong width, except for the fact that I went in the store, just to make sure, and asked a kitchen expert there, who took me over to several store displays where it became clear what the true answers were. The store displays were very helpful in clearing up a number of issues where one Ikea employee contradicted another. 5. The Utrusta undercounter lighting has electrical outlet modules that DO NOT meet code in most areas of the US for kitchens, where GFCI’s are required. Most Ikea store employees have no idea about this and nothing in the Ikea literature I could find talked about this. 6. The HUGE sized connectors and cable diameter on the Utrusta lighting extension cables make hiding the cables difficult and limit the size of the lighting units that will fit under the cabinets. Allow three inches for the connector/cable at the ends. In my case I had a 30″ kitchen sink that needed a light above but could only fit a 24″ light unit because of the bulky cables. 7. 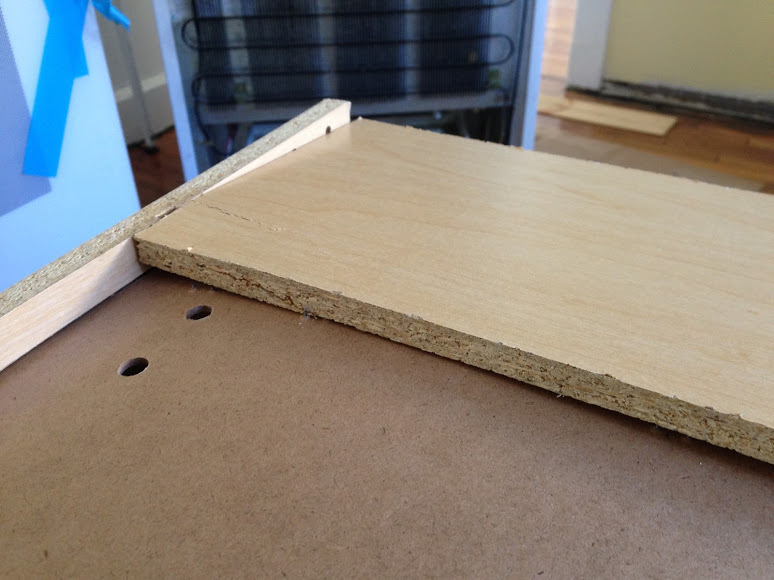 Use cabinet clamps to tightly hold the side panels to the cabinet before inserting the holding screws. Ikea’s bad choice of screws here with threads all the way down the screw shank tend to push the panels appart and make it hard to get a tight fit of the side panel to the cabinet. For side panel screws, first use an awl, then a drill to drill through the cabinet side, then the impact driver to set the screw. 1. On doors with three hinges, attach the top one first. I don’t know why but this seems to work better than doing the bottom one first. 2. Use a POZIDRIV screwdriver tip. You can use a Phillips, but the fit is “class B”. 3. Use an Impact Driver. This saves your forearms and shoulders, speeds up assembly, and avoids stripping screwheads. 4. Look at assembly drawings VERY carefully. They are almost always very accurate and answer most questions. In some cases, I did assembly wrong because I did not pay close enough attention to the drawings. 5. 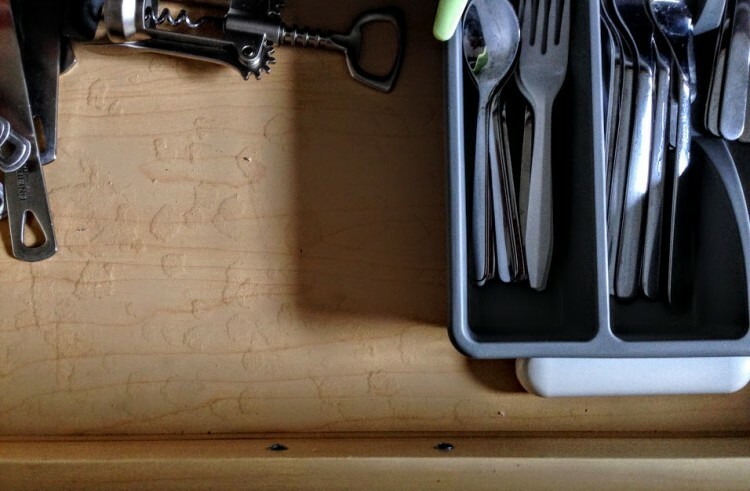 When allocating holes in the cabinet sides, keep in mind that hinge locations for the doors are fixed, so they take priority over drawer slide positions, which can be variable. Drawer slide screw position take priority over screws to hold side panels. Put side panels on AFTER drawer slides are in. So the sequence of assembly should be hinges first, then drawer slides, then side panels. 6. Do not use an impact driver on the hinge mounting screws. You need to “feel” when they are tight so use a manual screwdriver. 7. At least on the Bodbyn style tall doors that I used on the 90″ high cabinets, there in an “up” and “down” end on the doors. Make sure you have the right side up when attaching to the cabinet. Summary: In general the factory precision of the Ikea kitchen cabinets is excellent. Not your “cheap Chinese” stuff here. The cabinets are made in the USA, the glass doors in Italy, the side panels in Portugal, the Blum hinges in Austria. In fact the only items I found that were made in China were the door and drawer handles. I have zero complaints about the product quality. By the way, JD Power rates Ikea kitchen cabinets quite highly. you a quick heads up! Aside from that, fantastic website!